Living a healthy lifestyle no longer means sacrificing fast and convenient meals! Fast food typically contains tons of fats, calories, sugars, and salts that can wreck your diet and be detrimental to your health. With Primal Fuel, you can finally have a naturally delicious, highly nutritious quick meal option. 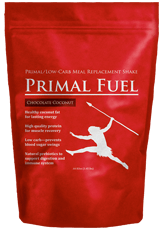 Primal Fuel includes 20 grams of the highest biological value protein available and defeats hunger with satisfying healthy fats from coconut milk. This shake is designed to help you maintain lean muscle mass while enjoying quick, convenient low carbohydrate meals! It is truly a delicious, convenient, and healthy meal option that satisfies for hours. Preparation takes only a few seconds, meaning you can enjoy Primal Fuel as a meal or a quick and healthy snack! It just doesn't get any easier than this. Available in natural chocolate and vanilla flavors, Primal Fuel will satisfy any sugar craving without sacrificing your health or adding hundreds of calories to your daily intake. Get your Primal Fuel today and start enjoying healthier food....fast!